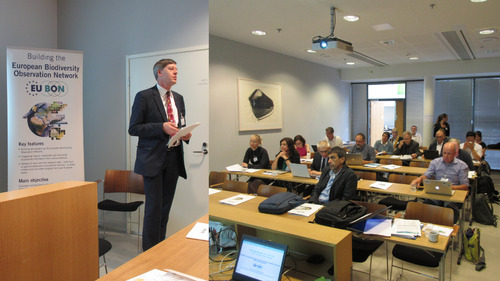 The 11th European Projects GEO Workshop took place between 19-21 June 2017, in Helsinki, Finland, bringing together European stakeholders interested in and actively contributing to the Global Earth Observations System of Systems (GEOSS). Alongside the plenary (see presentations here), the conference featured 20 sessions looking at various aspects GEOSS, its objectives and their implementation. Among those EU BON took part in a dedicated session titled ‘How Ecosystem and Biodiversity data and knowledge can support the GEO objectives’, alongside fellow projects and initiatives, and associated partners ECOPOTENTIAL, LTER-Europe, GLOBIS-B, EKLIPSE and ENEON. The session aimed to inform about recent developments of relevant projects that focus on Ecosystems and Biodiversity and also outline how the generated data and knowledge can support the GEO objectives and inform relevant policies on a European and global scale. EU BON, as a now completed project, opened the session by presenting its major products in particular the European Biodiversity Portal and how current and future projects can build on the outcomes achieved. For biodiversity and ecosystem approaches, European level efforts are needed to achieve comprehensive data coverage and full open access, especially for in situ data integration. Existing European-level data portals and information platforms need to be sustained and considered as integration points for national and local data hubs. Systematic approaches for biodiversity are needed, which means linking biotic and abiotic data and improving harmonization efforts for the whole data cycle/ workflows from data collection, analysis and dissemination for different disciplines (SBAs). Essential (Biodiversity) Variables (EBVs) are a key concept / framework especially for monitoring / long-term observations that should be applied for all available biodiversity/ecosystem data fields. Use examples from existing projects and networks as successful blueprints for bottom-up/user-driven approaches in GEOSS that relate to knowledge and user needs at the local scale.